Leptocoris affinis. Dried specimen from London Museum. Physical description: Dorsal side is mostly yellowish-brown except for pronotum, which is yellowish ochre, membrane, which is dark brown, and head, which is black with some yellow coloration around the eyes. Pronotum is densely spotted with a black furrow; it is also fairly wide and short. Ventral side is ochre. Extremities are dark in color, except for the femurs, which are ventrally light in color. 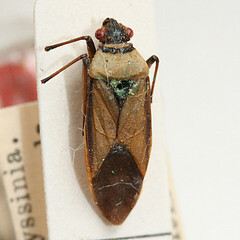 Leptocoris affinis has been found in Ethiopia, Kenya, and Eritrea but the exact locations of where it was collected are not known. Currently, we cannot infer a range for this species because we do not know what host plant it uses and have only one recorded collection point.